"Hello again, Thanks for the contact. Eel Pie Island. Those were the days my friends.... I've had a few 'blasts from the past' since I left a msg on your contacts page. Hope these pics are of interest to your readers. A fantastic site full of the 60's memories. I am lucky to be a part of it. I very much miss my friends from those days. Crossing that bridge with my drum-kit was a tremendous pleasure. However, I cannot ever remember going home afterwards.. possibly something to do with the ale!? Arthur and me turned out to be very good friends over the years and he booked my band on a fortnightly basis. It was the days when the 'rolling stones etc' became our interval bands. However, the strange thing is my band was the only band (as far as I'm aware) to be recorded or filmed at Eel Pie. This is documented on the series: 'Look At Life - Eel Pie Island'. With such a fantastic venue why was no other band ever recorded? Should anyone read this letter that knows me please contact me, I'd love to hear what you are doing now. Me, I spend most of my time in sunny Spain now and still live jazz. 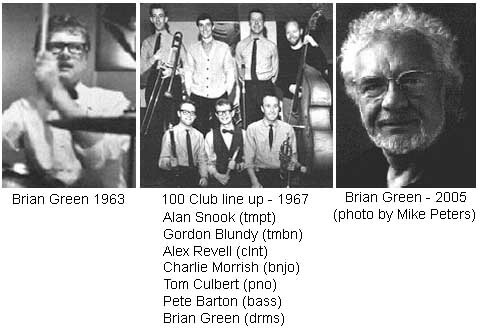 Take good care... and my very best wishes to all your readers... Brian Green & His New Orleans Stompers"